City Hall is the headquarters of the Greater London Authority. It is located on the south bank of the River Thames to the west of Tower Bridge. The building is made of steel and glass, was designed by Norman Foster, and opened in 2002. 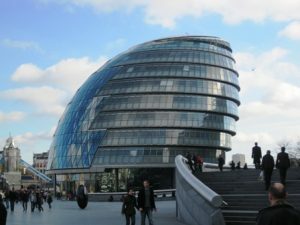 It has a bulbous shape and is known, among many other informal names, as the mayor’s testicle presumably because the first mayor of the GLA – Ken Livingstone – dubbed it “The Glass Testicle” and the second and current mayor – Boris Johnson – “The Glass Gonad”. A little known treat is that at the bottom of the helical ramp (which runs from the basement up the interior of the building to the top floor) is a carpet imprinted with an aerial view of the whole of London on which visitors can walk around and identify places and buildings. Parts of the building (a cafe in the basement and occasionally a viewing terrace on the roof) are open to the public on weekdays.